This is a fantastic picture taken before my mother was born. 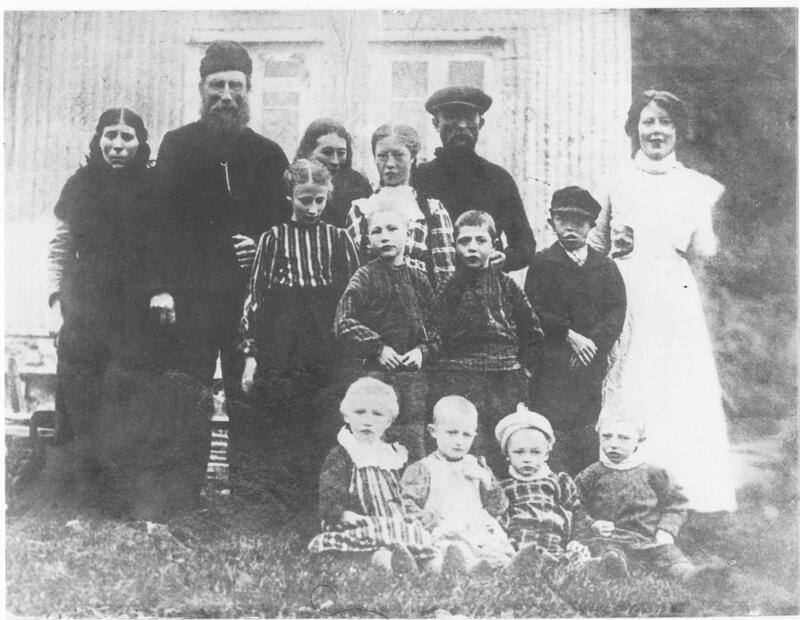 It shows my grandfather (Gudmundur), his wife, his parents, and the first born of his 17 children (or so). I hope to get names onto the group as soon as possible. 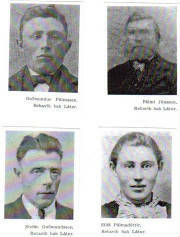 My brother, Sigurveig Palmadottir and I have tried to get a name onto these faces, but much is open to conjecture. THE PICTURE WAS PROBABLY TAKEN IN 1912, or a year or two later. Lady (3) - Ketilridur Porkelsdottir , wife of Gudmundur - died seven years after my mother's birth (an event that occurred far later than this photo). Girl (4) - Gudridur Palina (30/07/1900 - 16/07/1921) :- eldest daughter of Gudmundur. Died in childbirth. Family legend claims she was seduced (or raped) by a tutor hired by grandfather to teach his children. Lady (5) - Gudmundur's sister? Borgar Gudmundsson - has many descendants living in the USA. My brother has met Borgar. Suava Gudmundsdottir (07/01/1909 - 19/10/1940) - Asa (my mother was devastated by her death. It seems they were very close. It is likely that Suava supplied a surrogate mother role for Asa (see Ketilridur, above). Well about the family picture. For sure I remember having been told that the man second from left is Pálmi Jónsson. You say that you think this picture was taken in 1912, what a precious thing to have this picture, because I am sure it was a rare thing that pictures were taken of people at this time in so isolated place as Rekavik was and is. The woman farthest to the left then must be Ólafía Einarsdóttir, the second wife of Pálmi. The genealogy website Íslendingabók says that Guðríður Sigurðardóttir, his first wife, and mother of Guðmundur, was born 1850 and died 1887. Ólafía was born 1847 and died 1930. Pálmi and Ólafía got married 25.09. 1889.
my father, the third boy is Stefán, the fourth boy is Ingimar. The fifth girl in second row, I really dont know who she is. Stefán and Halldóra were twins, so the first girl in first row could be Halldóra, but I am not sure. The two next in that row seems to be girls, I determine it from what clothes they are wearing, and the last one in that row seems definately to be a boy. So of that reason this picture must have been taken later. One of the girls could be Svava, born 1909, if we stick to that the picture was taken 1912, but Borgar is born 1911, and the last boy on the picture looks to be at least three four years old. Hrólfur is born 1912, and Karlotta 1910 (?). This is hard to predict, but I will ask my mother more about this picture next time i visit her in Ísafjörður.